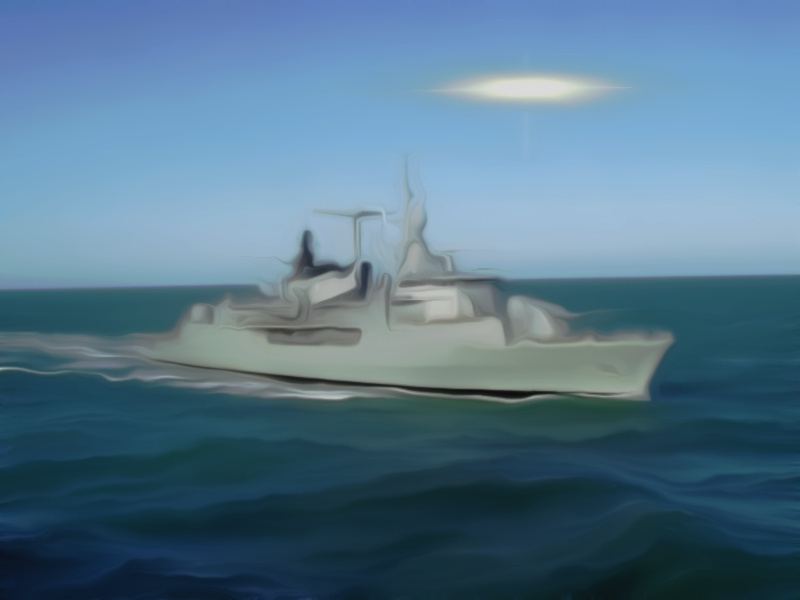 The Argentinean navy released a series of documents related to the UFO sighting of Necochea in 1962. The documents present the story told by a motorist who was chased by a flying disc around La Dulce. CEFORA recently published an article disclosing details of an important UFO sighting that took place in that city nearly 55 years ago. On August 29, 1962, Osman Alberto Simonini told his story about a UFO encounter near the 28 Km marker on Route 86. Simonini was on his way, leaving La Dulce, from the "Malabrigo" farm owned by Ernesto Arias. The case became widely known through an article in Ecos Diarios: The Navy commission launched an investigation through Captain Omar Paganini and the case now forms part of the private files of [researcher] Roberto Banchs. The incident took place around 8:10 pm, as Simonini drove at low speed and became aware - looking to his left, following his vehicle on a parallel trajectory at a distance of three meters and two meters above - of an "artifact" looking like two plates connected on their widest edges, gunmetal-colored, measuring approximately 5 meters in diameter. The object projected beams of green and blue light from its lower section. The beams were two meters wide, according to the description. Simonini says the artifact escorted him some 200 meters. The motorist was also able to see the grass moving as well, this being proof of its low altitude and some sort of "air or energy" expelled from the object's lower section. The object sped ahead some 200 meters, cutting him off some 600 meters ahead, near the road's shoulder at low altitude. Upon reaching the 26 Km. marker, the object executed a sharp 90 degree turn into the cultivated area. Simonini followed it and saw the object hover at a distance of less than a meter. He stopped and tried to approach the fence that separated the field from the road, placing his hands on the wiring, discovering as he did so that the metal was quite hot. He moved his hands away, only to find that the wire was even hotter further along. He wandered a few metes along the fence until he could make sure the wire was entirely cold. Two minutes later, the object took off at high speed and vanished into the sky. "Authorities specializing in these studies advised me that there was nothing extraordinary about the event, as phenomena of this sort was already being accepted as real, and that the scientific establishment was waiting for the next step: making contact with these artifacts. At the time, Guillermo Giménez (CEFORA member and a contributing editor to INEXPLICATA) conducted an exhaustive local investigation after Juan Jose La Terza had contacted him. The documentation includes the report written by La Terza, who acted as an advocate for witness Simonini.